Two years ago, the long 4th of July weekend was spent showering Tara with all the love I could give her as we said our last goodbyes. On Tuesday we'll be posting a special tribute on the actual anniversary of her passing, but we figured she should be the star of today's Sunday Selfies blog hop as well. I still miss my beautiful girl so, so much. What a pretty girl she wuz. 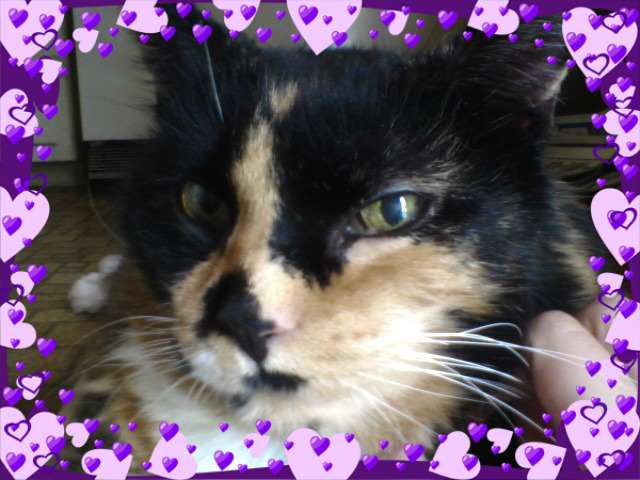 Tickles those whiskers, what a sweetie she must have been ... happy rainbow days to her! So pretty. Hugs to you. O I don't blame u, she is a SWEETIE! I like your purple heart-frame which sets off her beauty. Such a beautiful girl. So sorry for your loss. if only our furbabies would live forever - well they do in our hearts anyway. Tara was beautiful, kitties truly leave pawprints on our hearts. Tara will always be your beautiful girl. What a stunning photo and we are so glad she is joining us for this week's sunday selfie tribute. ((big hugs)) I fully understand the way you miss her and how deeply bittersweet the feelings are. Thinking of you. Tara was gorgeous! And flashbacks is always our favorites, especially of before cats! What a beauty. Mom has a special kitty who came before. She's been gone almost 7 years and mom still misses her so she knows how you feel. Tara was beautiful. I still miss my Siamese (Precious) who died 10 years ago. They are a part of us. Oh Ms. Melissa weez so sowry fur yous loss. Tara sure was bootyful. Weez sendin' lots of purrayers and hugs yous way. Of course you miss her. She was unique and special. That is a lovely picture! Please don’t get TW started. This will be 10 years for Nicky. I keep axing her, "what am I, chopped liver?" That’s what you should ax, Truffles. She was pretty and sweet, just like you (and I). We're just starting to get back to commenting and so glad to see Tara's beautiful pic . Sending you purrs of comfort and big hug. Two years already, ! But she will stay forever with you in your heart ! It's nice to have her tribute begin in the Sunday Selfies. Purrs to you, we are never really past the pain of losing a cherished family member. Tara was a beautiful kitty. Peace. What a beautiful kitty. It's so hard when we have to say goodbye to one of our fur-babies. I can't wait to see all my little fur-angels again. Remembering Tara! Purrs to you!